Time to shift gears into resume writing mode. 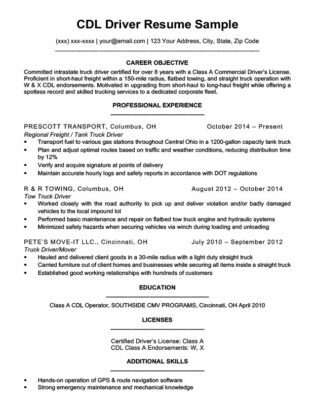 Our truck driver resume sample will give you the information you need to successfully write a resume that will get you more interviews. 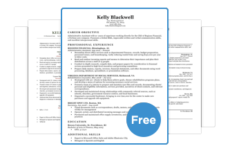 Or, if you have a need for speed, take our easy-to-use resume generator for a spin. Ready to move on? Check out our expansive library of cover letters for some extra tips. 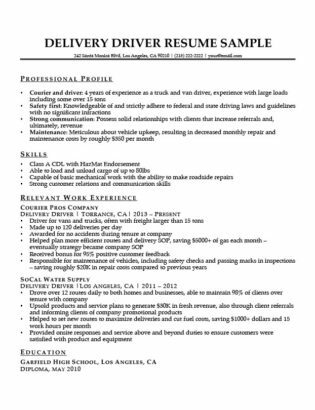 Long-distance tractor-trailer driver with 10+ years of experience delivering cargo to over 15 states in coordination with clients and operators. Seeking to bring driving and cargo delivery experience to a driver’s position in commercial truck fleet. Possesses a Commercial Driver’s License (Class A) with Hazmat and Tanker. With 1,701,500 U.S. truck driver jobs in 2012, the demand for drivers is expected to grow by another 11% by 2022. While only a high school diploma is needed for the position, tractor-trailer truck drivers are required to attend professional truck driving school and hold a commercial driver’s license. Ready to apply for positions? 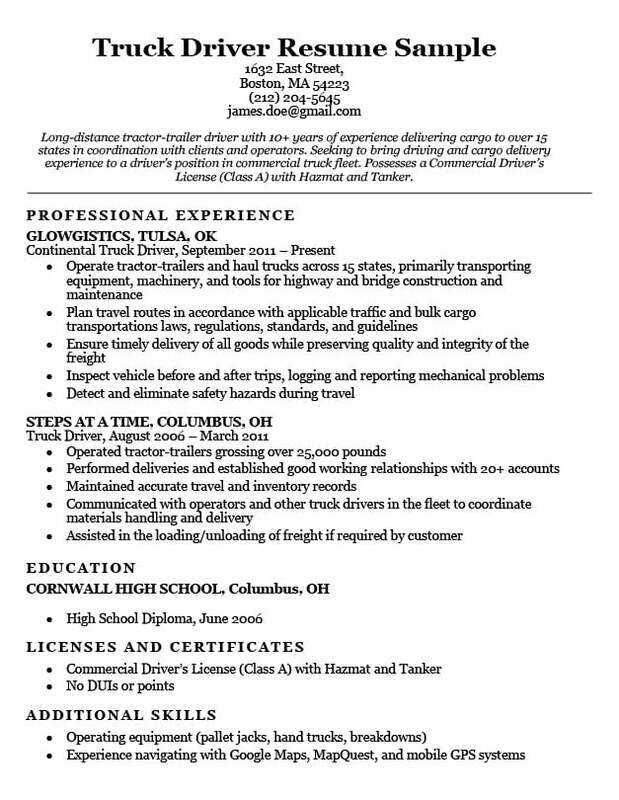 Check out our truck driver resume sample and resume writing tips to land your next interview. While you may speak in a more casual tone on the job, make sure your resume is written with a professional voice, through and through. The career objective at the top of the resume should state your qualifications and job interests to the reader. Highlight the best of your experiences, then explain how you would be a great fit for the specific position you’re seeking. The applicant gives a great overview of his past experiences, giving us a summary of his major duties, and also the geographical reach and number years he has worked. – Long-distance trailer-tractor truck driver with over 10 years of experience delivering cargo to over 18 states in coordination with clients and operators. – Seeking to bring truck operating and cargo delivery experience to a driver’s position in commercial truck fleet. – Possesses a Commercial Drivers License (Class A) with Hazmat and Tanker. The career objective functions as a preview and a summary of the body of the resume. 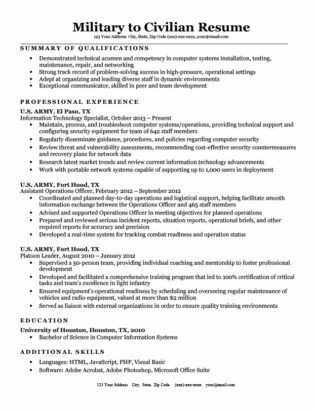 Our applicant used words such as “operate”, “plan”, and “ensure” demonstrating that he not only takes initiative, but that he also has the ability to see the work through. Along with these powerful, descriptive verbs, the applicant wrote out specific tasks and experiences that speak of hard skills that employers might be seeking. Read more about achievement-oriented language here. Why is it important to quantify your experiences? In short, presenting hard numbers provides the hiring manager a real reference point to gauge your skills. It also proves to them that you are able to achieve solid results. Our applicant provided a number of these reference numbers in “haul trucks across 15 states”, and “operate tractor trailers grossing over 25,000 pounds”. These numbers give more strength to her achievements, and also provide a solid context for her job skills and work capabilities. Consider this a space for you to list out other soft or technical skills that you haven’t stressed elsewhere on your resume. Think about what skills or even personal characteristics will make you a stronger candidate for the position you’re applying for. In this case, our candidate emphasizes the his ability to operate equipment, as well as his familiarity with navigational software. Both of these are useful hard skills for a commercial truck driver to have. Our candidate also uses this space to explicitly list out his licenses and certificates. 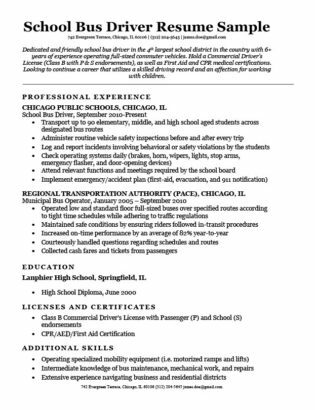 If you have more questions about how to write a trucking resume, please leave a question in the comment section below. If you are in a hurry, our online resume builder will help guide you through the writing process in minutes.